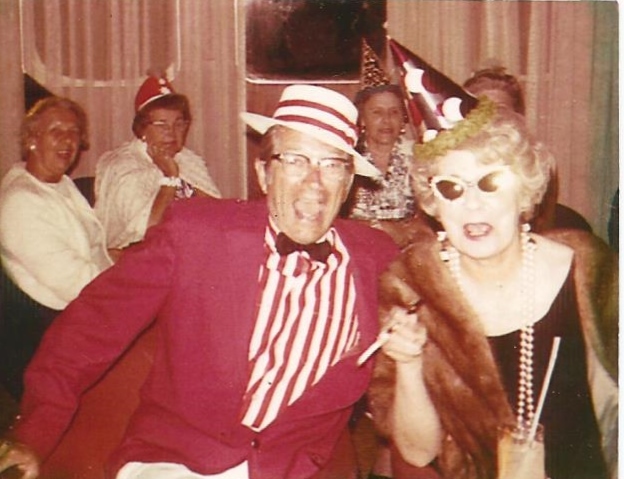 My grandfather, on a cruise with my grandmother wearing his signature red. Libellule is celebrating our fifth season with our “Newspaper Collection: Black, White and Red All Over.” This collection is a tribute to Leigh’s grandfather who used to wear red on rainy days to cheer up the people in his small, southern town. His strategy must have worked because they rewarded him with a day in his honor and a parade when he was in his eighties. Every model coming down the runway will be wearing something red in his honor. This collection is different for us because we have never shown a lot of black. I think just by virtue of the fact that black and red are such bold colors, this is looking like a very strong collection. There are motifs that have shown up organically in the design process that surprised us, such as Chantilly lace, cowl necks and low backs. We are also showing quite a few knit pieces, our favorite being a small lace dress that is lace on the outside, but soft cotton jersey on the inside…. So comfortable! Our Chantille Dress, Lace fused to cotton jersey. Elegant on the outside, like wearing your pajamas on the inside! This collection makes me want to brush up on my French, don some red lipstick, put on one of these elegant looks, pop open my red umbrella and head out on the rainy Paris streets to some fabulous café. I actually had a totally irrational moment the other day after I finished our Biddington dress whereby I was jealous of the model who gets to wear it down the runway. I had to remind myself that I made the pattern and the original sample and could easily make another one… after the chaos of fashion week is over, of course. Valentine trench with over 200 hand cut silk rose petals. Fashion week is upon us. We are showing next Friday the 21st of March with New Orleans Fashion Week. We are super excited about the romantic location of the Marigny Opera House. It is just lovely and so typical of what you think of when you think of New Orleans Spaces. Our models will be walking to a live band, another first for us. Our show is at 5:30 p.m. and tickets can be purchased through the Nola Fashion Week website listed below. We hope to see you there!